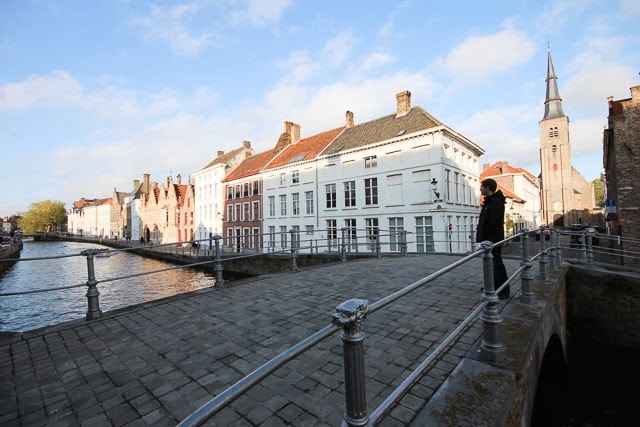 Have you seen In Bruges with Colin Farrell? It's a profanity laced, dark comedy that takes place in, you got it - Bruges. While the film wasn't necessarily a favourite of mine, every time I think of that Belgian city, I want to say, "F***ing Bruges." 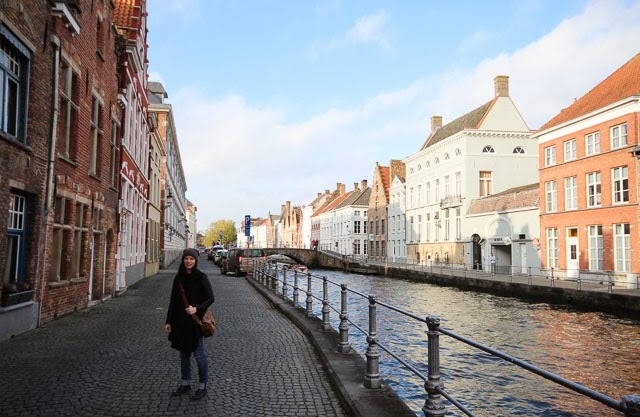 Back in November when we made our return trip to Brussels, both Joe and I were excited to get to Bruges. When you hear people speak of this city, it's often in conjunction with the word 'fairytale.' 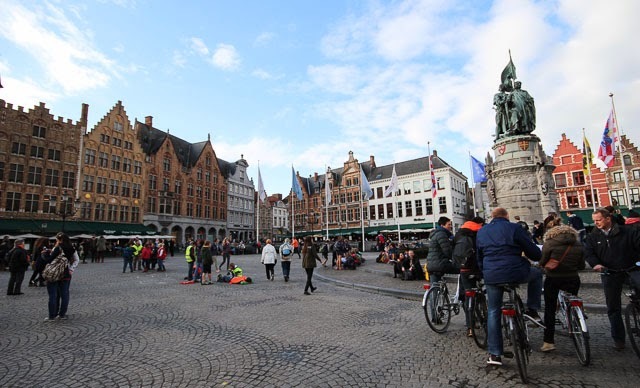 Bruges is one of the best preserved medieval cities in Europe and it's filled with cobblestone streets, quaint canals and historic buildings. 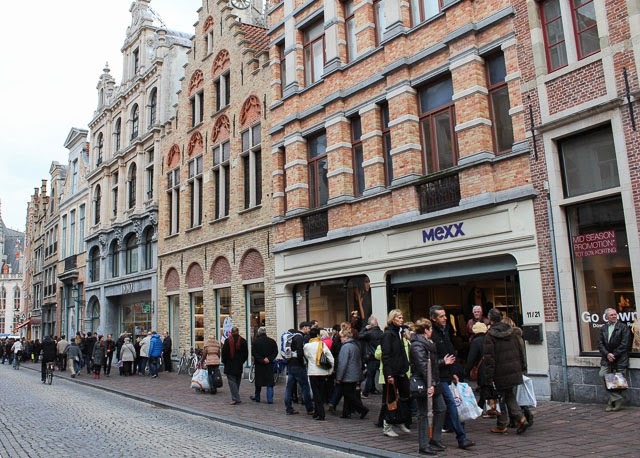 The journey from Brussels via train is just over an hour long and despite visiting well into Fall, it was so busy! In fact, the train was so full Joe and I ended up standing with several others in front of the doors between two carriages for practically the entire journey. It was not pleasant and our feet were tired before we even arrived in the city. Thankfully, there were plenty of seats for the return trip that evening. 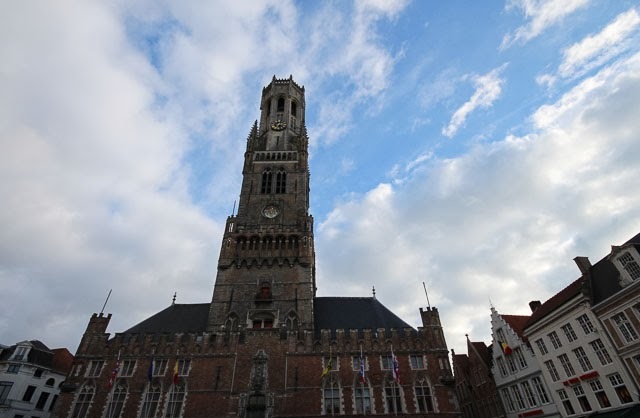 However, as we ventured out further from the crowds, we found the Bruges we were looking for - the quiet canals lined with homes, the tiny cobblestone streets, the towers rising above the city into the sky. I felt like every corner we turned just kept getting better and better. 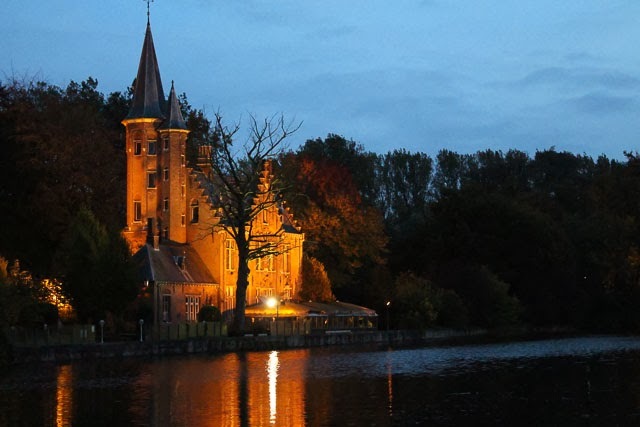 As nightfall arrived and we made our way back to the train station to return to Brussels, we both remarked that it might have been nice to stay one night in Bruges. The city felt quiet and romantic in the dark and an early morning bike ride before the day-trippers arrived would be lovely. 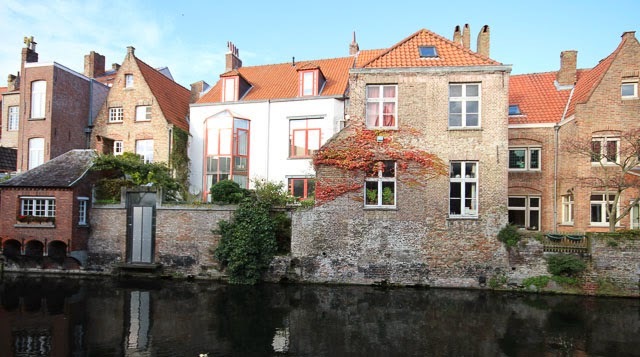 PS There are so many great B&Bs and guesthouses in Bruges. This one looks fantastic, the garden at this one is gorgeous and who wouldn't want to stay in this former castle? 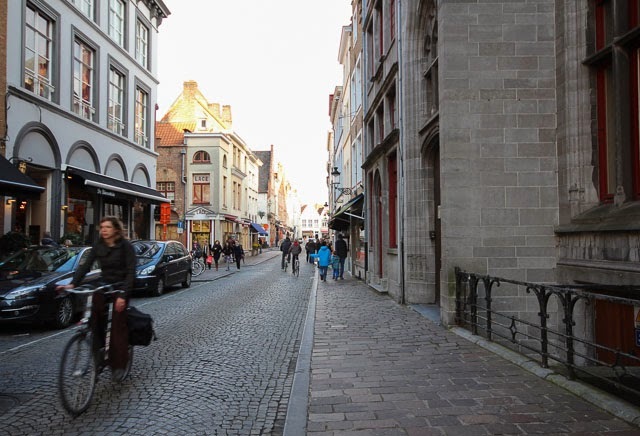 I would love to visit Bruges! Something about a city being along the water just makes the houses look so cozy and adorable. And I would def not say no to staying in the castle! 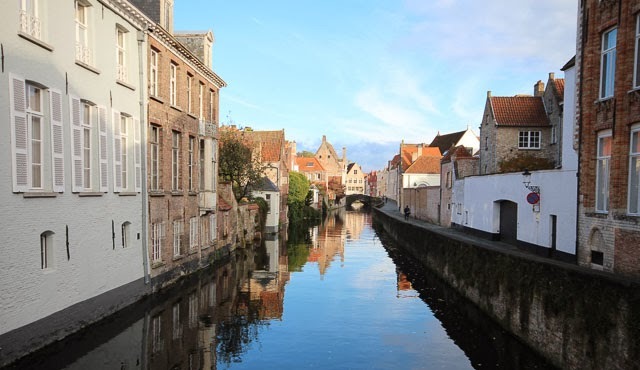 We are so excited to make it to Bruges this coming October and we're going to stay a night there just for the reason you said, to take it in after the hustle slows down. Can't wait!!! Ooh it looked like it was a nice day to visit Bruges! Sorry to hear about the trains... I can't believe it was so busy, we went in summer and the train ride was a nightmare too! Oh gosh, I can only imagine it in the high season! You're right - f***ing Ghent does not have the same ring to it. I've heard good things about that city as well. Perhaps that'll be our next stop if we find ourselves in Belgium again. 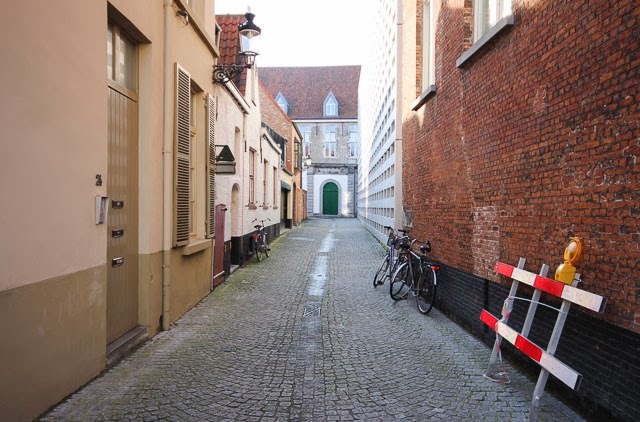 You should stop by Ghent, it's lovely! 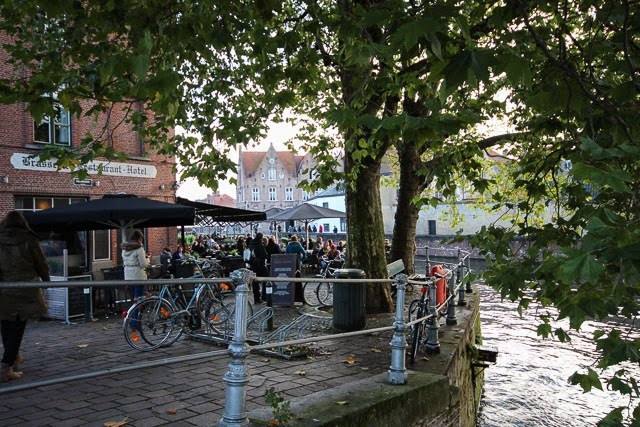 I've haven't spent a lot of time in Bruges to be able to compare, but I've heard Ghent is less tourist-packed than Bruges, but still totally charming and full of great cafes. It's funny how the movie casts such a shadow on such a pretty city. Of course, all of that changes once you visit for yourself! Bruges looks amazing! Speaking of Colin Farrell, have you seen the trailer for the new movie he is in? It looks interesting! Go back to Bruges. Stay a couple of days, go mid-week, shoulder season, whatever, but just get back there. Stay away from the Markt. Rent a bike and ride out along the canal, past the windmill, to Damme. Have your evening meal at Bistro de Schilder, get the rabbit. And be careful with those Belgian beers...everyone says they creep up on you...it's true! Check out the backpacker hostel, and the pizza joint attached to it. Nice people there, more reasonable pricing. It really is a wonderful little town, you just have to give it a little time and stay away from the areas that are most crowded. Just one guy's thoughts, but hope you give it another try. Jay, you're making it sound as if we hated it! We actually quite enjoyed our time there. We expected it to be a lot quieter given that we visited in November but definitely found our way away from the crowds. Unfortunately, the likelihood of us making it back midweek for a couple of days is quite slim. Vacation days are limited and to make the most of our time, we're usually traveling over weekends. Thanks to Colin Farrell, I no longer can think of Bruges without thinking of him either. i'm having such travel fomo right now. i NEED to be in Europe. my heart aches to see those buildings and hear different languages. UGH can't wait until we're based in England again and can just zip off to places like this! I loved that movie and I'm still dying to get to Bruges. I'm living in Amsterdam, but I remember looking up treehouse cabins in Belgium. I always find Brussels so boring, but Belgium on a whole seems to be a pocket of scenic gems.